The Weinstein Company’s (TWC) highly anticipated drama THE CURRENT WAR is currently shooting in London and surrounding areas. 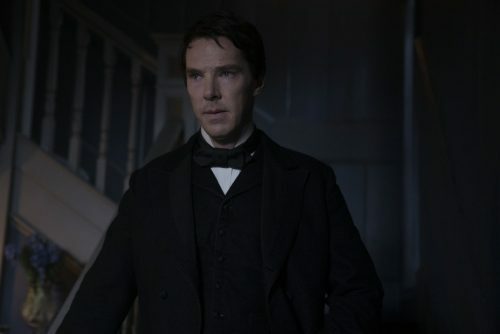 Academy Award® nominee Benedict Cumberbatch stars as Thomas Edison alongside Michael Shannon’s George Westinghouse. Katherine Waterston, Tom Holland, Matthew Macfadyen and Tuppence Middleton also star with Nicholas Hoult set to play Nikola Tesla. Written by Michael Mitnick (The Giver), the film will be directed by Alfonso Gomez-Rejon (Me and Earl and the Dying Girl), with Basil Iwanyk (Wind River, Hotel Mumbai), Timur Bekmanbetov, and Harvey Weinstein producing, and Cumberbatch and Adam Ackland executive producing. THE CURRENT WAR marks the third collaboration this year for TWC and Basil Iwanyk. Other projects in production include Hotel Mumbai starring Dev Patel and Armie Hammer and Wind River with Jeremy Renner and Elizabeth Olsen. Set in the late 1880s, THE CURRENT WAR details the rivalry between Thomas Edison and George Westinghouse and the race to create a marketable and sustainable electricity system. Edison championed the use of a direct current for electric power distribution over an alternating current, which was backed by Westinghouse Electric and a host of European companies.